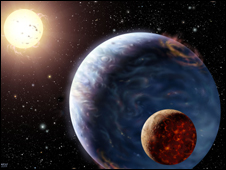 Astronomers from Queen's University Belfast (QUB) have helped to discover 10 new planets. The discovery was announced at the Royal Astronomical Society's largest ever National Astronomy Meeting at Queen's. The extrasolar planets - which orbit around other stars - were found by an international team using cameras in the Canary Islands and South Africa. The Queen's astronomers are using cameras designed and manufactured by Belfast company Andor Technology. The Wide Area Search for Planets (SuperWasp) project uses two sets of cameras to watch for events known as transits, in which a planet passes directly in front of a star and blocks out some of its light, so from the Earth, the star temporarily appears a little fainter. 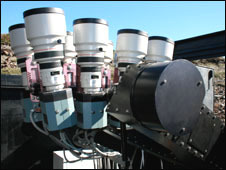 The cameras work as robots, surveying a large area of the sky at once. Each night, astronomers have data from millions of stars which they check for transits. The transit method also allows scientists to deduce the size and mass of each planet. Forty-five planets have now been discovered using the transit method, and since they were set up in 2004, the SuperWasp cameras have found 15 of them - making them the most successful discovery instruments for this type of work in the world. Announcing the results was QUB's Dr Don Pollacco. Speaking before the meeting, he said: "SuperWasp is now a planet-finding production line and will revolutionise the detection of large planets and our understanding of how they were formed. "It's a great triumph for European astronomers. "Queen's and the Particle Physics and Astronomy Research Council funded the first SuperWasp on La Palma; the camera was designed and built at Queen's." Among the planets discovered using SuperWasp are WASP-12B. A year - its orbital period - on WASP-12B is just 1.1 days. The planet is so close to its star that its daytime temperature could reach a searing 2,300C. Scientists have found more than 270 extrasolar planets since the first one was discovered in the early 1990s, but the pace of discovery has been accelerated by SuperWasp technology. The Particle Physics and Astronomy Research Council has changed its name to the Science and Technology Facilities Council. 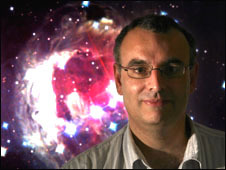 It is the main astronomy funding body in the UK.